I have a ritual that I do every time I visit Rocky Mountain National Park. But before I tell you about that first I should ask the following: Are you familiar with this park?? It is quite simply breathtaking. The park is about a two hour drive from Denver and now that the roads have been fixed after 2013’s crazy floods you can drive up there pretty easily. Most people will visit the park for an entire day, I have also camped in the park a couple of times and there is nothing better than waking up to the crisp mountain air, getting a fire going while looking at the snowcapped mountains thinking-WOW! This year is Rocky Mountain National Park’s Centennial celebration. It’s 100 people!! There have been floods, fires, and crazy snow, but the park still soldiers on. Estes Park is usually everyone’s first stop before entering the park. It is a small mountain town that is at the base of the park’s entrance. I highly recommend spending a day exploring Estes Park before going to RMNP. Estes Park like a number of towns throughout Colorado has a strong local business community. If you would like a nice cup of tea and a great pastry I highly recommend Moon Kats. I am not a huge fan of cats so I was a little put off by all of the cat paraphanelia but I gave it a try and I absolutely loved the service, the tea, and the pastries. Another business I would highly recommend is the Colorado Hats and Company Store. I have visited this store for years and the couple who runs it are fantastic! If you’ve ever wanted good quality Western goods I would strongly encourage you to check out this store. It is also located along the river walk. Also, there is a river walk that is behind the Main Street. Most people miss this but it’s really nice to check out and there is a Nepalese restaurant along that walk that is pretty affordable. Just ask any shop keeper and they will give you additional details. You can also rent a room in one of the many quaint hotel/motels that line up along the creek that goes through and around town. Often you’ll wake up and see deer drinking from the creek in the early hours of the morning. Don’t be surprised by the sheer number of people driving through the park during the “High Season.” Get your mind out of the gutter, I’m talking summertime! I would strongly recommend going in September to watch the Aspen leaves change from green to gold. It’s still busy but more with local traffic. As you drive through the park you will see (hopefully) herds of elk, the occasional moose, marmots, and chipmunks. They are wild. I can’t tell you the number of times I’ve seen people trying to get a selfie with an elk with 11-12 point (huge) antlers. This is a disaster in the making. The animals will maul you and that will ruin everyone’s trip. Now, that we’ve wandered through Estes Park, gotten a hat, some tea, and picked up a bag of salt-water taffy it’s time to drive slowly through the park and just take in the view. I have visited the park for many years and it never gets old to me. I like going at different times of year, during summer with the crowds, during fall as snow starts to dust the tops of the mountains and in Spring as the snow begins to melt and the flowers started poking through the snowbanks. The are several points a long the way where you can pull over and check out the view. I recommend doing this as it will balance out the driving that you will be doing. Also, the higher up you go the more ballsy you have to be about the drive. Switchbacks, people, switchbacks…and sheer cliffs along the drive. Just focus and you should be o.k. 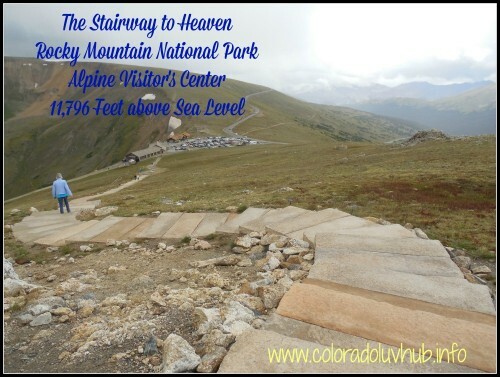 The highest continuously paved road (Trail Ridge) is located in the park and you should be taking this road eventually to the Alpine Visitor’s Center. You have to stop there. That’s an order! If the weather is good…read-no lightening. Then you are in for a treat. Ok, that’s not what the stairs are called, but that’s what I call them. Every single time I go to RMNP I have to walk up those stairs. Slowly, steadily, basically gasping for breath as we are at way above sea level. Finally, I make it to the top. It’s windy, gorgeous, and so silent. Even with the other people around me who have climbed to the top, it’s quiet. I like to meditate at the top. I also empty out my mind of all worries because I am amazed at how phenomenal this experience is. Will this be open Oct 13-17? Hi Pat, that always depends on the snow. Sometimes Trail Ridge Road closes around that time, so I would keep an eye out on snow conditions.